OT but BA catering – we’re booked on the 0645 LHR – Tenerife (TFS) and have been checking the catering – am i right in thinking we’ll only get a hot breakfast? Seems small for a 4.5 hour flight. Thers are a whole bunch of airlines you could fly 5h+ and get nothing. Not sure about your flight, I would have thought it went under ET/CE so likely the usual offering. You will get a delicious hot breakfast (2 choices as a main) and you can choose from a selection of warm pastries. Thanks Bkev! Looks like I’ll be hungry when we arrive! We’ve just come backdrop San Diego and The White Co wash bag appeared. Certainly the bag is a vast improvement over the cloth shoe bag thing previously issued. Contents are broadly the same …moisturiser, pulse point stuff (?!) lip balm from WC,The pen, toothbrush etc eye mask and socks are all the same, with socks and mask now in grey. Bedding as before . However, the 747 was clean, in fact sparkling! We always use our avios to fly fort when we can. We recently flew from LA to London, and when I asked for a sleep suit and mattress, I was told there was not any. Does this mean there usually is bedding and sleep suits? In First from the West coast, yes, most definitely. Is it maybe just the case that Do&Co need more time to scale up, or that there is still a GG contract in place that can’t be broken at this point in time? To be fair, I doubt they ever said that Do&Co was taking over catering. It was implicit, however, given that Do&Co food was used at the PR launch along with Do&Co branded crockery. So it’s basically the usual smoke and mirrors, but we knew that as soon as we saw through the stage-managed appearance of the Bollinger. Be nice to see the £600m figure taken apart to see what it’s (allegedly) going to be spent on, and over what period. I thought the food is presented with a little card that says Do&CO? Even the trolley service has a Do&Co logo? Or is that to NYC only and unbranded for the other pseudo-do&co routes? The latter. That said, if BA agreed a long-term contract with Do&Co I’m sure they would make the necessary investment in new facilities required to produce the volumes required by BA. Gate Gourmet could be bought off with a few quid. Question: how long did it take BA to roll out a pillow? I just flew out of LHR on BA0073 to Abu Dhabi; World Traveller Plus ticket. Cost was over 1800 pounds. I was seated in Row 19, window seat. Traveller Plus Configuration rows 16 to 21. By the time I was offered a meal. No choice available. Take it or leave it. BA service for nearly 2000 pounds. why would you pay £2k for WTP? Surely CW is much less than that? If you book weeks in advance, yes. If you are travelling for work at a few days notice, no. Can you not preselect a meal on all WTP routes out of LHR? I’ve told BA to “leave it” in exactly that circumstance and had no meal. Luckily without having paid so much. When British Airways catering got really ridiculous even on long-haul my response to being handed a small chocolate bar as ‘second meal’ 9 hours into an 11-hour flight was “Please take it back. British Airways clearly needs it more than me”. Is this bait and switch? Would a complaint to the Advertising Standards Authority about British Airways advertising and promotion of ‘new’ catering mentioning a supplier they’re largely not using for it, have any effect? I flew BA first a380 from LHR to JNB on a 241 last week and an hour into the flight we lost power and IFE for the 4 seats down the right hand side of the first cabin (we were seated in 2k and 3k). The power never came back. Full cabin so we were just stuck with no power for the remaining 10 hours of flight. The crew were excellent given the situation and did their best but the experience was ruined. No lights, no power to charge devices, couldn’t recline our seats so the crew had to manually recline the seat either fully upright or flat. The service manager made us fill out a customer relations card and said someone would be in contact but we haven’t heard anything from BA yet. No status with BA at the moment and we’re flying back in club world in a couple of weeks. Does anyone have any experience with BA customer relations and how they might handle this situation? If you think it would help your complaint you can send a Subject Access Request to BA (they usually respond quickly) and this way you will receive a copy of whatever notes the service manager submitted to head office about the failures. Good evidence to be armed with when complaining, if nothing else. Try Twittering. Social media platforms seem to get better response. I guess it’s harder for anyone to hide when problems are posted on these for all to see. Yes, even for an F passenger. No, it isnt what it should be. Yes, 2 months is a realistic time frame. If you hear back sooner you got *lucky* – you just get to start the negotiations earlier. I’d query how you handled the situation. Did you look for a seat in biz (or even WTP) You could easily have been served F drinks etc but ‘enjoyed’ a more comfortable seat (or bed) in the circumstance….coupled with IFE of some description (and power). Could it even be fraud? A legal view would be interesting. A number years ago in F we received 50000 avios each for flying in an old style config. This is the level I’d be satisfied with, but my expectations these days would be less. 20,000 maybe? You are probably right – we received 20k for a service-related complaint but it wasn’t as bad as this example. Contacted BA via twitter and got a very quick response for more details and a phone call shortly after. We were both offered a good amount of Avios as compensation which we accepted. Their social media team seems very good and overall happy with the outcome. They will have someone call you and apologize but they wont compensate you. I flew two weeks ago from Muscat to London in Business Class and just as breakfast was served I saw a cockroach climbing up my window and had to smash it! The crew were lovely and submitted an incident report right there and then. Customer relations just called me (20 days post flight) and said sorry–no compensation for cockroaches in business class and that is that. So so sad British Airways–going to fly elsewhere now. June no doubt being your travel date. I’d expect it by March/April. So, my question is. Why would someone pay the premium for BA when you can fly gazillion airlines with superior business/first class experience? Even when I am flying for business and the company is paying for it, I have a choice to take multiple different carriers. I have never booked BA. There are only 4 seats per flight so surely it can’t be only points, so there must be a lot of people who are actually paying BA for that. All things being equal BA would not be my first choice. All things are rarely ever equal. Just wondering why you would subscribe to these BA threads ,if you never fly them ? I fly BA because of Price. Is BA J and F the best there is no of course not but it is not as bad as some make out. I think that’s a sensible question. For me points & 241 work well, never had a problem getting what I want but I tend to plan ahead. Coming from the outer reaches of the UK connecting in LHR is ok but I’ve used the ME3, although ex EU proves more difficult without the regular London connections. I don’t wear BA tinted specs, but balance cost, convenience and expected levels of service. Using 241 is totally understandable, it’s not paying cash though. I’ve never paid cash for BA J & F, only points. I have paid cash for J and F on ME3 from the UK but found the layovers less than ideal to the far east. As I said ex EU doesn’t work for me. Cost v Convenience when maximising the number of days in a final destination (plus the expense of the positioning flight and hotel). Two days travel at the start and end of a holiday isn’t worth the saving to me. There isn‘t a lot of airlines flying to the US who have a better product consistently. It‘s only a recent development that airlines have a better on board product on even some aircrafts, but you could still end up on an aircraft with worse seats, especially in First. The second reason is the price. 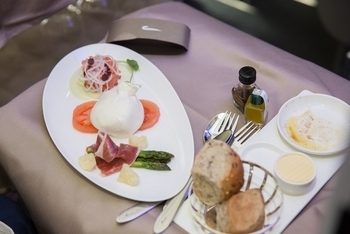 Lufthansa has the better seat, pre-flight service, and a more consistent service on board. But it‘s 2000 Euros more expensive with fewer US destinations than BA. I guess it‘s different to Asia, but that is not where I‘m flying to. I see. I should have mentioned that I am flying mostly to Asia. This makes sense. This in a nutshell is why I only use BA for point redemptions and never cash. I tweeted BA last night asking them to justify charging £343 for the 40 hop from LHR to MAN in September (so hardly last minute). Their response was that they are sorry I am unhappy with their prices. No explanation for the culling of the service and charging £1.70 per mile flown! Why would they explain the price?? It is what it is, even if it doesn’t make sense, so find another flight/airline, or book BA anyway. It’s either the genuine price due to demand on that flight and date, or it’s an error that’ll rectify itself in a few days. Either way they don’t have to justify the price/service, so vote with your wallet and let the market decide. Booking flights isn’t a version of ‘Let’s Make a Deal’ – it’s take it or leave it. You could have got a walk-up train fare for £80ish return (off-peak). You chose to fly and pay that price. There must have been a reason… BA is just tapping into that whatever that reason was. Welcome to the free market, it’s how the world works. Get a train! It would be much quicker when you factor in transfer to/from airport. Also conserably more environmentally friendly. And cheaper. Seems a no brainer unless I’m missing something! We flew CW recently, no amenity bag, 1st & 2nd meal choices not available. Stewardess didnt even bother to offer any alternatives like a WT sandwich, pretty appalling. I’m not going to say I look forward to the food (it’s BA, remember the Brits’ idea of food is something useful, not something nice), but new bedding will certainly be an improvement. “The Brits’ idea of food” ?! This is a British blog you know. +1. Somewhat of a backward and incorrect view of our tastes and food expectation. I thought I was on a different site for a moment…. Really?! A regrettably cliched, stereotyped and inaccurate response. Other than in Italy, I have been served bad food in every country across Europe at some point or other. I have had bad food in Italy on a number of occasions. There are thousands of places where you can get bad food aimed at tourists. As an Italian living in UK, I agree with your comment. You can also find excellent food in UK. It’s up to us to do our research in advance (when possible) via web or (in my opinion always the best option) asking a local. 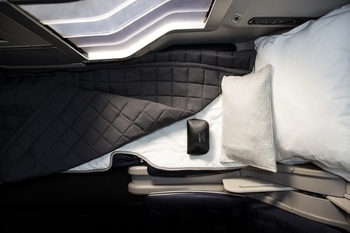 Did anyone watch the Channel 4 documentary on Singapore Airlines new First class suite? BA arent even close to competing with it. I also watched an old Heathrow documentary which included the first BA 787 flight to KUL – the flight delays were comical, and BA made a big deal of the afternoon tea service which isnt even served on the KL flights (in and out are overnight flights). CV3V, do you have the name of tge documentary please so I can try to find it on catch up? It was really interesting to see that a UK company were fitting the suites. Very nice product. Great to see British built suites. Shame about some of their staff and choice of “Analysts”. We were on their 3rd flight in F..it was amazing then..got the program recorded to watch when we get home.